Our first president undoubtedly had a significant impact on the nation, the U.S. Capitol and the city that bears his name. While George Washington did not take the oath of office in the District of Columbia, he did help choose the the location of the capital city, selected commissioners who retained Pierre Charles L'Enfant to design the new capital city and laid the cornerstone of the U.S. Capitol. And while Washington never actually graced the halls of the U.S. Capitol – first occupied in 1800, a year after Washington's death – his presence, influence and even his likeness, is everywhere. 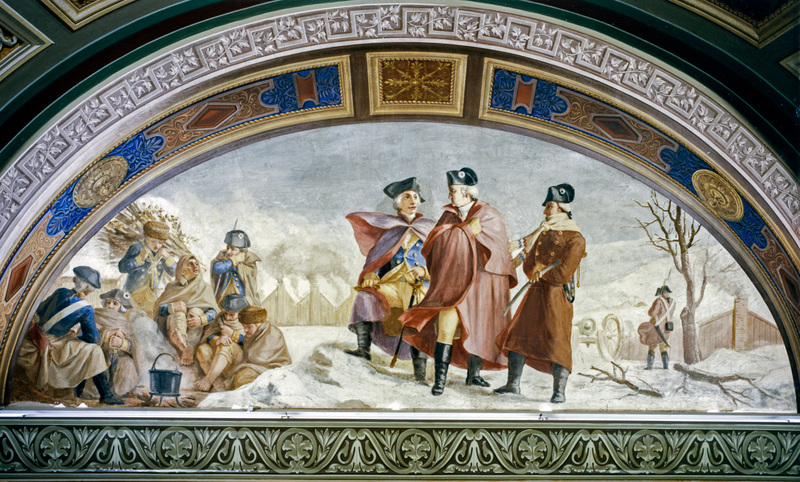 The art honoring Washington most-often seen by visitors and staff on Capitol Hill are located in the Rotunda. Two floors above the intended tomb of Washington – he was never actually interred here – in the eye of the Rotunda, is Constantino Brumidi's The Apotheosis of George Washington, a mammoth painting featuring mythological and historical figures. 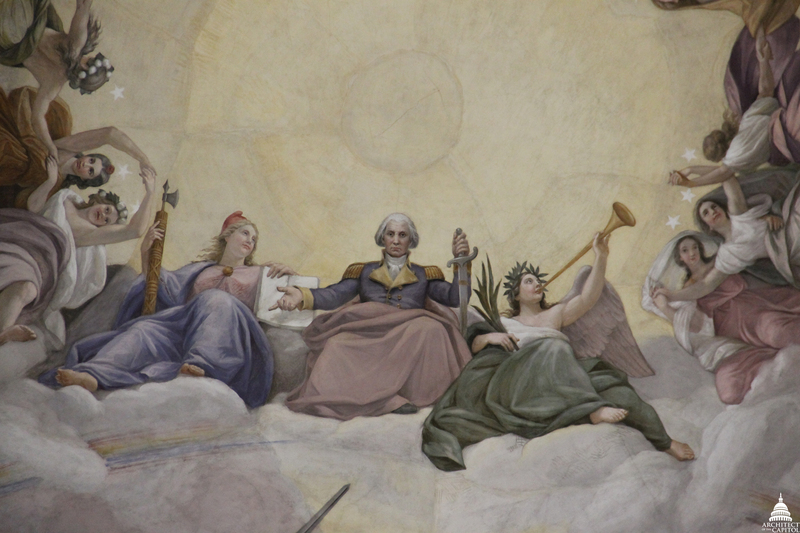 Washington is depicted in the center as if a god seated in majesty. 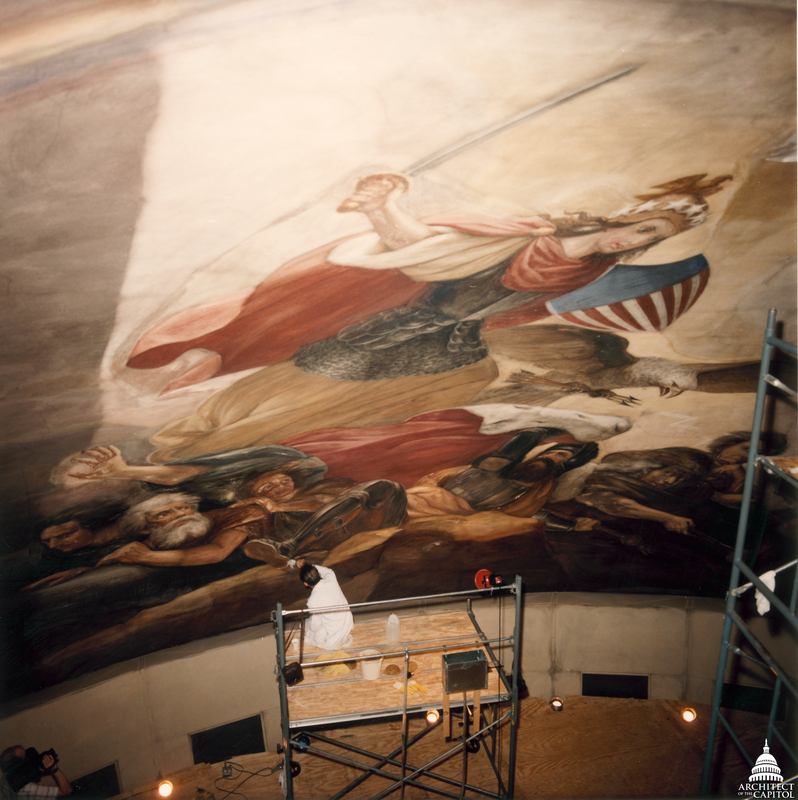 To those on the ground, the subjects in the painting look life size but in actuality they are approximately 15 feet high (a conservator is shown above right next to The Apotheosis for scale). 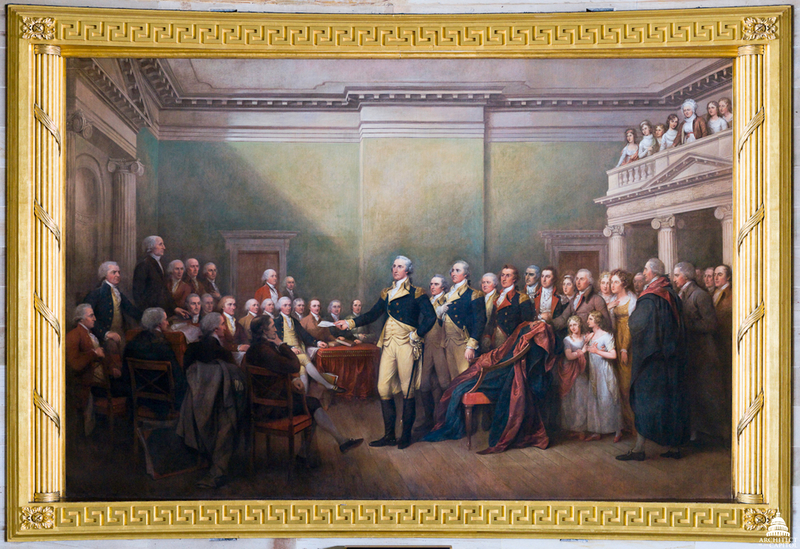 Two additional paintings in the Rotunda also honor Washington, Surrender of Lord Cornwallis and General George Washington Resigning His Commission (above right) by artist John Trumbull. The bronze statue of Washington (above), positioned near the south door of the Rotunda, was given to the National Statuary Hall Collection by Virginia in 1934. Washington at Valley Forge by Brumidi (above) is a painting rarely seen by the public. Located on the south wall of the modern-day Senate Appropriations Committee room (S-128), this painting was originally designed for the Military Affairs Committee room in 1871. 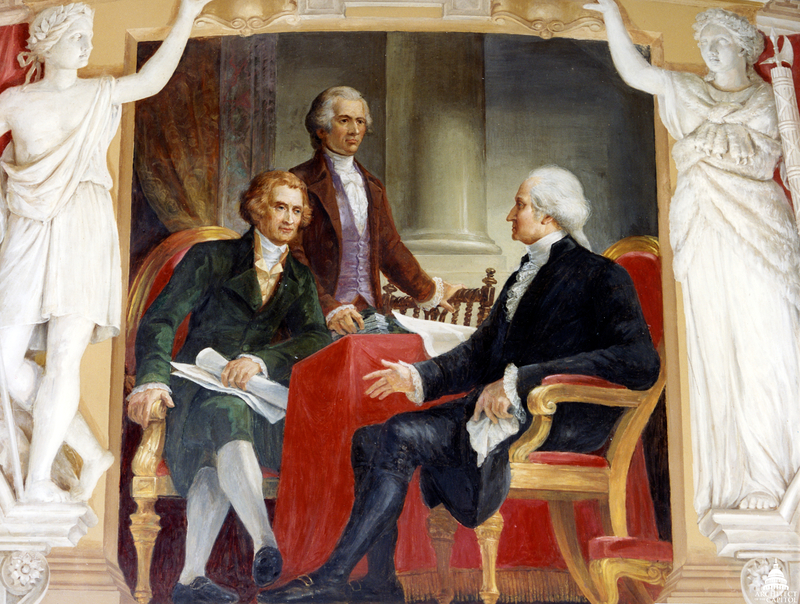 Upstairs, in the Senate Reception Room (S-213), a painting depicting Washington with fellow Founding Fathers Thomas Jefferson and Alexander Hamilton – also by Brumidi – is on the wall. 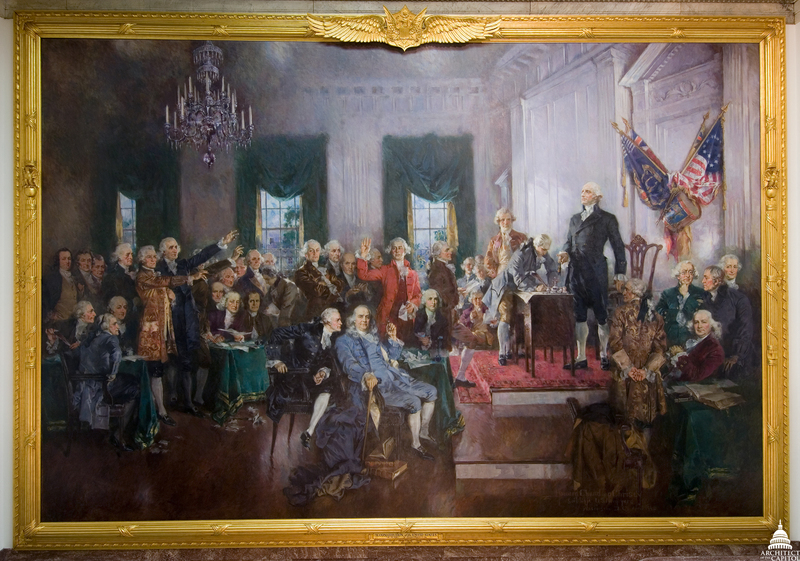 More recent artistic renderings of Washington include Howard Chandler Christy's Scene at the Signing of the Constitution of the United States. The 1940 painting, located in the East Stairway, depicts Washington standing on a platform at Independence Hall in Philadelphia. Franklin is seated in the center of the painting with Hamilton and Madison. 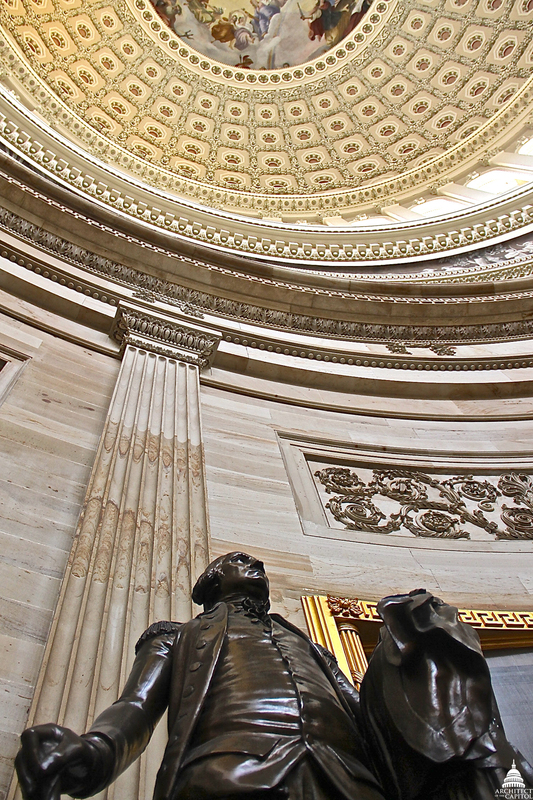 Approximately 35 pieces of art feature or include Washington's likeness in the U.S. Capitol. In honor of Washington's birthday, what is your favorite piece of art featuring the nation's first president? Hi Ann, these two female figures represent Liberty and Victory/Fame.